Now that Project Mamma has been settled, for the time being at least, I feel I can breathe just a little better. Not exhale completely mind you. Villa Paradiso is still on the market and it must, MUST be sold. We’ve got a wonderful agent working for us….or, more appropriately, working for our mamma, but still, sis and I (and our husbands too) will not be able to breathe easily until the house is sold. Simply put, mom needs the money to live out her days in her new home. Sis and I have been talking every day since returning to our respective homes. We continue to wrap up little Project Mamma details (bills, forwarded mail, and the like). We also continue to compare our phones calls to our mom. Mom is famous for saying one thing to sis and then sharing a completely different story, or version thereof, with me. We know that with our mamma that the truth is always somewhere in the middle. While talking to sis last night we got onto the subject of food. We do this often. In fact almost every time we talk or get together food is at the top of the list. We love food. Some people eat to live. We live to eat. We’re half-Italian after all, so no explanations necessary, right? And, Sis is a wonderful cook. She is not lazy in the kitchen like I tend to be on occasion. Case in point, last night Oysters Rockefeller was on her menu. “Wow,” I say mighty impressed. “You’re having Oysters Rockefeller for dinner, and you’re not having company over? I asked. “No. That’s just our appetizer.” She said. I think she added that pork chops on the grill were also on the menu for the evening. “How elegant,” I say. “Gee sis, I’m almost ashamed to tell you what I’m having for dinner,” I added. Folks, I should probably state that I have just a thing or two on my personal wall of shame and what I am about to say is one of them. Of course I risk the disappointment of my beloved friends…and the horror (to be sure) of my sweet Italian family. Fortunately, my sis judges me not! But I must come clean. I promise that what I ate is a rarity. And, also, for the record, Rocket-man is away on business travel so it is just moi and The Poodle. In fact, as God is my witness, the last time I ate this particular frozen food item was two years ago when I moved to this here middle earth, an act born out of depression over being plucked from the Beach Cities of Southern California to Northern Alabama. And, to be fair, if any one of you were to look into my freezer at this very minute, you’d find it empty of the bad stuff. There are salmon fillets, several bags of various veggies, and yes, ice-cream (I don’t view that calcium source as bad!). So what could be so bad that it’s on my self-proclaimed wall of shame? 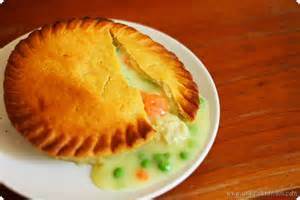 Marie Callender’s Chicken Pot Pie! Whew. Glad that’s over. Almost feels like being back in the confessional. Sigh. Yikes! 34 grams of fat in this pot pie. Seriously folks….I’ll swear the freezer door at the grocery store opened entirely on its own and the package literally levitated itself from the shelf right into my grocery cart! Cookie and I shared cupfuls of laughter over my confession which truly brightened the morning. Laughter really is the best medicine folks. Way better than a pot pie…though I’m fairly certain that my dear friend’s gourmet chocolate chip cookies might trump all. Anyhow…note to self: I need to talk to the Divine Miss Cookie more often! Damn straight my chocolate chip cookies would trump all! I loved talking to you Ms. Bliss! I will be in the car soon…!! !